The First Ever Wacky Wednesday Challenge at the Latte Lounge!! Every other Wednesday, yours truly (Stacie) will be hosting a challenge at The Latte Lounge that will run for 2 weeks! The Challenge Theme for Wednesdays is going to be "Wacky Wednesday", so be prepared for the unexpected!! We're going to try to present challenges that are both different and intriguing! This week, I have decided to start out with something to honor the State Fair, which is in full swing in our area! You can get everything at the Fair, from fried Oreos (YUK!) to corn dogs and cotton candy! But the one thing all these delicacies have in common is that they're all served on a STICK! Your project can be ANYTHING as long as you include at least ONE piece of REAL wood!! It can be a popsicle stick, a kabob skewer, a toothpick, or a twig from a tree... ANY REAL WOOD! As you can see from my inspiration photo, I opted for some YUMMY candied apples on popsicle sticks! I made the apples with Cinnamon Candies so they're super-YUMMY!! For the "Crafty" portion of my project, I used 3 different cut files from SVGCuts.com. The tag is in the Double Layered Tags collection and the Masked Boo Caption and the Cuddly Halloween Ghost were both FREEBIES!!! Look at all the CUTE stuff you can do with FREE files!! So! Come on over to the Latte Lounge and bring your "Wacky Wooden" Creations with you. The challenge will run for 2 weeks and the winner will receive 2 FREE images from The Stamping Boutique! Stamping Boutique SNR Group from 7-9 pm CST. Tracey is giving away the complete line of Candyland to one lucky winner on Digi Day. 1.- Go to the store and purchase a winter/christmas image. 2.- bring it with you to digi day and show us. 3. get entered into a drawing for the entire line of wonderful Candyland images. Hope to see you and your project there! We will be celebrating winter/Christmas. The other info I wanted to pass on is about a wonderful opportunity to help others. Jodie at Bugaboo is doing a fund raiser for 2 fabulous organizations. Jodie's son is raising money for UNICEF and she is offering 7 free digis to anyone who makes a $10 donation. Jodie's son and Cammy's daughter both have Type 1 Diabetes and they are currently working to raise money to find a cure for Juvenile Diabetes. Again Jodie is offering 7 images for a $10 donation. I hope that you will consider making a donation to these organizations. Next week will be an exciting week around here -- we have 2 new DT members to introduce (maybe 3) and some awesome new challenges that will be starting. Be sure to stop by and say hi. 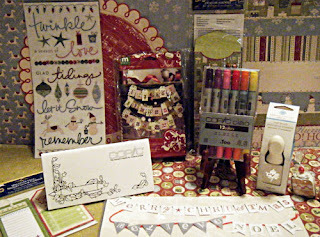 Huge blog candy with Copics, MS punch and new My Yellow Bicycle Christmas papers!!! It's blog candy time again. This time we're giving away a set of "12"Copic Cioa's. Same rules apply. Just leave a comment and post this to your blog with the good ole' link back to enter. If you sign up to be a new member at The Latte Lounge you get an extra entry for that. Just please leave another comment to let us know. There are lots of chances to win. The winner will be chosen at random on December 1, 2010. Making Memories advent calendar kit. Martha Stewart Maple Leaf punch. This is a good one ladies. This is so exciting! Good luck everyone!! I'm sorry I'm so late in posting this. Good morning! It's time for me to host another challenge at The Latte Lounge. I was so excited to have 19 play along in my last challenge, I'm hoping to get even more this time. For this challenge I would like you to use The Colors of Fall on your creations; browns, greens, oranges, yellows and reds. You can use any images, stickers, die cuts, etc... from any company. So have fun with it. The challenge will run for 2 weeks, so you will have until November 4th to complete your project. Remember if you finish a 3D project for this challenge by Oct. 31 you can also enter it in the Month long challenge that Melissa is hosting. Yay, I like 2 for 1 entries. This is Willow from Michelle Perkett. This one is from Pattie's Creations. And, this one is from The Stamping Boutique. So, get crafting and lets see those fall creations. I hope you'll all play along. Featured Member - Tracey Malnofski!! Can you believe I've never had Tracey as our Featured Member!! Not only is Tracey a fabulous artist, she is also a very good friend. Hi everyone! I’m Tracey Malnofski. I’ll try to make this as interesting as possible out of my quite uninteresting life. LOL! Some of you may know that I’m the artist and owner of The Stamping Boutique. So drawing and running my business is how I spend most of my time. I live in Yorktown In, but grew up in Las Vegas, NV. Big culture shock there. Nothing more embarrassing than trying to tip the kid at Marsh for helping carry out your groceries, or the UPS guy. LOL! I was trained since infancy to tip, tip, tip. That was one cultural difference of many I learned when moving to Indiana. I started in 2001. So that’s 10. Wow! You’d think I’d be better at it. I was visiting my sister in AZ and she had all this fun stuff out. You know the stuff. PP’s, glue, glitter. She taught me how to do some basic things and it was so much fun. I still have those pages and OMGosh! They look like a 5year-old did them! LOL! My Glue Glider. It’s the best adhesive around. The best I’ve found anyway. What is your favorite paper crafting company? My favorite crafting company is October Afternoon. I’m anxiously awaiting “Modern Homemaker” to be released at the moment. Copic, of course. Isn’t that everyone’s. I have to say I’m an original though. About 3 years ago I wanted to try brush markers for their convenience. I’d been watercoloring mostly up until then. I bought one of about 10 or 15 different types of markers and worked with them all. Copic was my favorite hands down. This was before I’d ever heard of Copic. So I started collecting them and now I proudly own every single color of sketch marker available. Sure. I love reading and horseback riding. I have a horse I adore. I like to crochet. I’m a USTA 4.0 ranked player, but I took 3 years off. I’m going to get back into it in the next couple of weeks. I’m super nervous about that. I’d like to thank everyone reading this for making TLL such an awesome place to be. It’s home sweet home. Most importantly, I want to thank Tracey for giving us such a wonderful home on the web!!!!!!! Our Monthly Challenge is open until October 31st. Prize - 7 Bugaboo Digi Images of your choice. I wanted to share a few cards I made using one of Bugaboo's fun Halloween images from the October kit - 20 images for $20. 100710 - Theme - Fall/Halloween - You can use images from any company to enter so please join the fun. Not to mention you can enter the same project in both challenges!! Also don't forget our DT call!!! We would love to add to our team in our efforts to continually improve our site and to offer more challenges. - host a challenge every other week here on the site as well as post about it on your blog. - 40% discount in The Stamping Boutique store. The term will start in November and be for 3 months however it may be extened beyond that. If you are interested in joining then please email me at mczapor@oh.rr.com. The Stamping Boutique Digi Day at PCP TODAY!!! Hi all!!! I just wanted to let you know that The Stamping Boutique is having a digi day at Paper Craft Planet this afternoon. The theme is Think Pink in honor of Breast Cancer Awareness month. What - lots of fun, games and inspiration. I sure hope that some of our TLL friends can jump over and join the fun!! Create a 3D Project with a Fall theme. It can be a banner, box, table setting, whatever you'd like. I need some inspiration for fall and Halloween decorations. Yep you can enter your project in both the monthly challenge and Rhonda's current challenge-- 2 chances to win with one project -- can't beat that. The prize -- 7 (yes you read that correctly 7) Bugaboo images of your choice. Jodie's images are in my top 3 digi stamp companies. I love the range of stamps she has - cute, funny, just all kinds. Bugaboo also just started a new monthly kit 20 images for $20. You can't beat that!!!! Deadline is- Sunday October 31st at 11:59PM. Hope to see lots of inspiring projects!!! Create a project with fall or autumn theme. Thanks as always for stopping by!!! Have a wonderful week!! Hi all!! I'm trying to get myself back on track this week so I'm moving a few things around. My goal is to post every other day or so. I also want to get my challenges up and going again. Our featured member this week is MARIA CASTILLO!! I just love her work. I think it is so cool that she joined us at TLL. Maria lives in Costa Rica but types wonderful English!! My name is María and I´m 32 years old. I´m from Costa Rica and I´m married with the love of my life. We have two lovely children: María Paula and Luis Fernando. I live in a small town about 50 kilometers from our capital city, San José. I´m a High School literature teacher and I work full time, so sometimes I don´t have enough time to scrap!! I totally love the paper crafts and all the wonderful things this hobby brought to my life. I began about 2 years ago. I have a very good friend who started me in this awesome world of paper crafts. Since here in Costa Rica it is a little bit difficult (and extremely expensive) to buy scrapbooking supplies, I have learned to work without many embellies. I think paper is the most important thing, the rest are fantastic as well, but I can live without them!! I love Cosmo Cricket, Prima and Websters pages. I´m just beginning with digi images, so by now I´m using my color pencils. I hope to buy my first copics soon!! I just want to say Thanks to all the awesome people I have met in the world of paper crafts! All of you gave me your friendship, your ideas, your sweetness and your inspiration!! Thank you so much!! I absolutely adore Maria's style. If you want to see more of her work be sure to visit her blog.